Before you start a blog, the question bobbling around your head is? Maybe you already know, maybe you don’t have a clue. Maybe you have hundreds of ideas, maybe you have none. This post here will help you nail down your niche once and for all. By the end of this post you will know exactly what your blog will be about. Also you will know if the niche you have chosen is CORRECT (explained later). So all you need to do then is put your finger on the screen and do eeeeeeny meeeeany minnnnieee mooo (bosh) and there you have it, your blogging niche has been chosen (but you might not like it so you’ll have to keep doing it until you do. A very important question which is CRITICAL to your blogging journey. ANSWER A – to share your thoughts, create an online diary/ journal, to have a creative outlet, for fun, as a hobby etc. ANSWER B – to help people, to solve problems, and to turn your blog into a business so you can make money to pay your bills, quit your 9-5 and truly live life on your own terms. If you have no intention of turning your blog into a profitable business and you want to blog, just to share your thoughts, and write about all the things you love as a hobby – great! If you chose answer B! Hell yeah CHAMP! You’re in the right place and THIS IS FOR YOU. 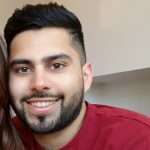 If you want to blog for a business and make MONEEHHHHH you need to follow this guide. To create a blog that you can turn into an income stream and a fully-fledged business you’ve got to do things in a certain way. Because not choosing the right niche will almost guarantee failure from the GET GO. I will show you exactly how to choose a niche, how to help people solve problems, all while turning your blog into your new business. Sure, if you chose answer A.
It’s the biggest load of wishy washy horse manure advice from some online “gooroo” who know’s nothing about building a profitable blogging business! Let’s say I am passionate about creating and cutting apples into animal shapes. I blog all day long about it, how I make them, how long it takes, all my designs etc. Do you think I can turn this passion of mine into a business? Firstly the niche is too small. Blogging purely about things you’re passionate about will NOT allow you to turn your blog into a business. 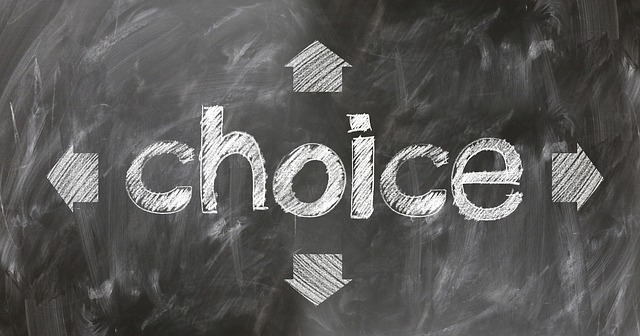 You need to choose a profitable niche! Now before you run for the hills and think oh no! As long as your chosen niche ticks those 3 boxes you’re on the right path. If you are passionate about a niche and it ticks all the boxes, BINGO that’s perfect. But like I mentioned earlier, blogging purely about what you’re passionate about doesn’t always work when building a blog as a business to make you money. Another big mistake is if you find a blogging niche which has a massive audience, but is not profitable. Which is why getting this right from the start is very important. How do you exactly know if your chosen niche has a large audience and is profitable? So let’s start by thinking about what you are passionate about? Do you read blogs about a certain topic all the time? Answering those questions will give you starting point. Make a list of 10 topics that you have an interest or passion in. So let’s say you have an idea for a niche. Next step is to break down your niche idea into a sub niche IF it’s too broad. You should have a list of niche ideas now. This next step is to check if those niches have a large audience. 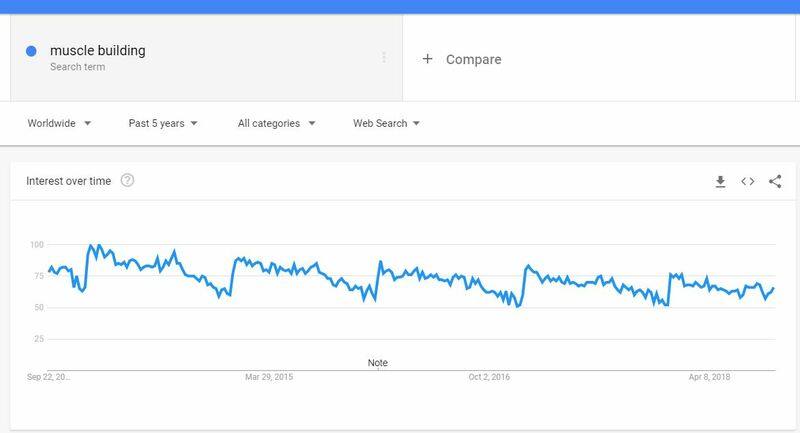 The quickest and easiest way to do this is by using the Google trends. I have set the search settings to worldwide, to search over the past 5 years, on web search. Google Trends will show you if the topic has interest and how many people are searching for it. Also it shows you if a niche is stable. You can set it to search over the past 10+ years. This will give you an indication if the niche is consistently popular. As you can see “muscle building” looks like a great niche idea. Over the past 5 years, the interest has been stable and is always above the 50 mark which is a good indication of a popular niche. This means the audience is big enough to drive traffic to your blog for many years to come. Google trends also suggests other popular related niches at the bottom which can expand your ideas. By now you should have a few niche ideas, that you’re interested in, and be proven to have large audiences. This final step is VERY important. It’s time to check if the niche has money in it. Your plan is to build a blog for business. So you need to ensure your niche is profitable so you can monetize your blog and earn an income. 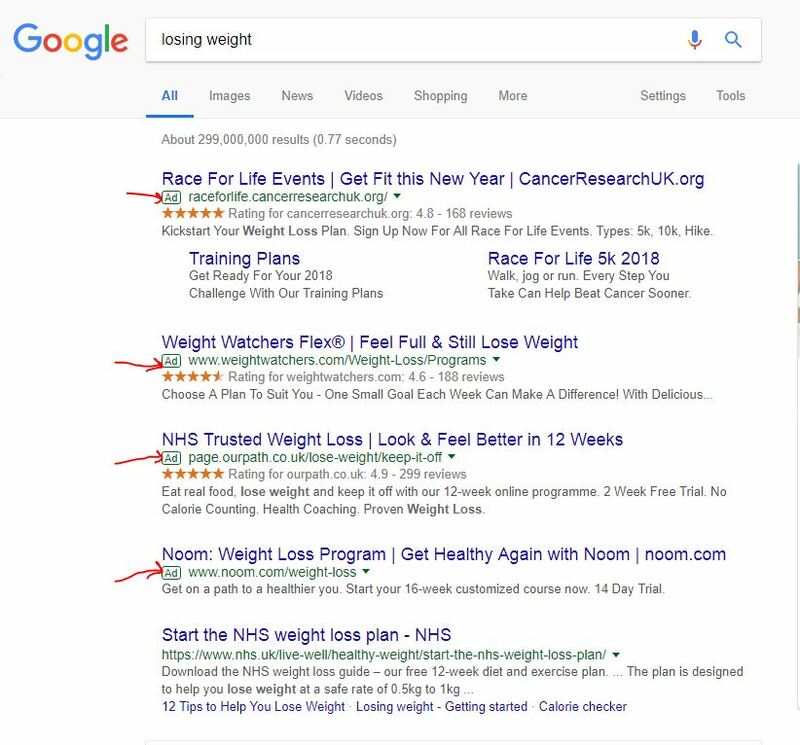 At the top of the search results you can see it has multiple ads. These are ads that advertisers pay to have on Google. Simply put, if an advertiser is willing to pay for advertising on Google for this niche, this is a profitable niche. People wouldn’t be spending money on advertising on Google if they weren’t making profit. Another way to check if your niche is profitable is by going over to the almighty Amazon. One of the biggest websites in the world. The reason why we want to type our niche into Amazon is to check if there are related products for sale. From the search results you can see there are hundreds of products for sale related to this niche. From pills, to books, to equipment etc. This is proof that there are products that sell in this niche. If your niche has books and magazines in, that is another BIG GREEN LIGHT. From the search results you can see that ”The Fat-Loss Plan” book has over 200 reviews, which means this book has sold extremely well. This is a very hot profitable niche. Not only are there multiple physical products for sale, there are also books and magazines that sell in this niche. Which means information sells in this niche, you know people are willing to pay for information. You know that this niche is profitable and could be easily monetized. A great way to start monetizing your blog is with affiliate marketing. What is affiliate marketing? It’s where you sell someone else’s products or services and you get paid a commission. 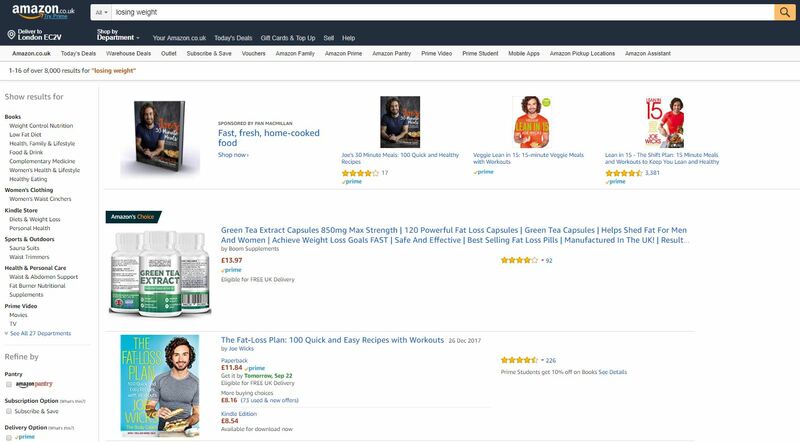 Even Amazon have their own affiliate program. So you could display ads on your blog that relate to products in your niche from amazon. People already know and trust amazon so when they click on your link and purchase you get paid a commission. This is just one of the ways you can make money from your blog. You now know exactly how to come up with niche ideas. How to check if your niche has a large audience. And how to check that your niche is profitable. You now can start your blogging journey knowing you have a solid foundation. You know you won’t be wasting months or years in a niche that won’t turn into a thriving business. I got your back champ. Below is a list of 20 profitable niche ideas. Research has all been done for you. What niche will you choose?